The GlobeCore Process is performed continuously on most energized transformers without the need to remove, replace, and dispose of contaminated Fuller’s Earth sorbent material. No hazardous waste and a one man crew equals lower costs and efficient operations. 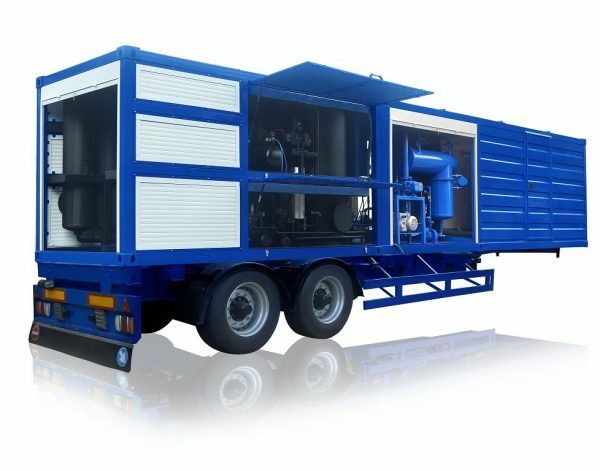 The CMM-R (Mobile Oil Regeneration Plants) units are designed to extend the useful service life of the transformer by full and complete restoration of the dielectric strength and chemical composition of the transformer’s insulating oil. All CMM-R units feature the automatic sorbent reactivation system. GlobeCore Regeneration units use the GlobeCore Process to remove acids, moisture and other contaminants from the oil, improve oil color, increase oil stability against oxidation and lower gas solubility. The GlobeCore Process also removes acids, water and contaminants from the insulating paper and windings. While degassing and heating the oil, processing capacity is expressed in L.P.H. When regenerating the oil, processing capacity is expressed as the amount of oil treated per cycle. The amount of oil treated will depend on the amount of Fuller’s Earth in the unit and the acid level of the oil being treated. E.g. one kilogram (1 kg/2.2lbs.) of Fuller’s Earth can treat approximately 4 liters (1.056gals) of oil with an acid number of 0.2mg KOH/g. The amount of oil treated per 1 kg/2.2lbs.of Fuller’s Earth increases proportionally to a decrease in the acid number of the oil. GlobeCore Process units can also be fitted with an optional DBPC-2.6 inhibitor injector unit. The following table shows the typical GlobeCore Process results. GlobeCore can custom manufacture models in any configuration and is willing to explore new design solutions to meet your specific needs.